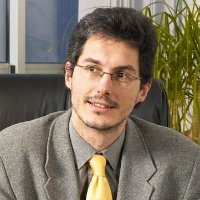 Jacques Fayolle is co-director of the French Télécom Saint-Etienne Engineering School in Information Technologies where he is responsible for driving local research activities on interoperability for Information Systems. In this article, Jacques talks about the concept of a “remote lab” where users can access the lab via an Open Wonderland collaboration space. In this tough economic climate where limited resources are an obstacle to securing necessary laboratory equipment, there are unique opportunities. In the area of lab research, for example, different phases of work such as “production” and “monitoring” may not always be co-located. That is to say, highly technological and pricey instruments are not always controlled in situ (may not be in the same place or locale as the operator). There are, moreover, many companies that cannot afford to own all the instruments they need to carry out their work successfully. Out of necessity, companies have begun to pool their resources and form groups of economic interest, often known as the “Extended Enterprise,” that collectively leverage and enable the purchase of expensive devices. In research and development, companies often need quick access to a given resource, but may only need that resource for a limited time, which does not justify the investment to purchase the equipment. By gaining access to equipment through groups of economic interest, firms can conduct work that would otherwise be out of reach economically. This scenario is particularly relevant in the learning field where devices used in production and are often re-used or re-purposed for learning. This is most likely done for economic reasons because it, in effect, doubles each investment. Other benefits of remote labs, similar to Cloud Computing, relate to the training of workers and administrators. Instead of having to train workers on new equipment, it is possible to bypass the cost and time by relying on a group of “learners” who are already trained on the equipment and are able to operate it remotely. One of the biggest challenges is how to generate the remote lab platform. We do not want to re-engineer software for every device or for each device class. Take a trivial example of the development of a single graphical user interface (GUI) allowing all devices, both electronic (operated primarily by buttons) and mechanical (mainly equipment that moves) to be presented graphically. Currently, this cannot be achieved without significant ”special case” or customization work in software integration and development. To reach this goal in a more practical manner, we propose a semantic web approach and to describe the remote GUI as a semantic file. More details on our proposal can be found in our “Nuggets of Research” document (PDF, in French) and in this IEEE Intelligent Systems article on the use of semantic tools for remote labs and how they improve the quality of learning. Basically, in the proposed scheme, a Web Ontology Language file is used to describe the GUI (location, size, skill level of each widget) and the functionalities of each external device. The global architecture relies on a J2EE architecture. An Enterprise Java Bean loads and interprets the semantic description. Commands and results are broadcast to each participant through message-oriented middleware. The client is a standalone application which is deployed on the client side through Java Web Start technology. On the server side, we use software from the OW2 consortium including a Jonas J2EE server and JORAM Message Middleware. Another big challenge we face is collaboration inside the remote lab. Indeed, according to constructivism theory, it has been shown that the quality of learning is strongly dependent on the sharing of skills between and among participants. One of the main drawbacks of the remote lab is isolation of the remote user (a caricatured geek, alone in front of his computer ;) ). Therefore, the question to address is how will the remote lab platform support collaborative work? Let’s look at the following scenario to gain a better understanding. Suppose that Dave (the professor) and Alice (his student) have to conduct a practical session on device 1, whereas Bob (another student) has to work on device 2. Dave, Alice and Bob launch the remote lab software (for example, an instance of an OCELOT client using Java Web Start) on their own computers, which then loads the semantic file corresponding to the device they wish to use. Group awareness/interaction between Dave and Alice is facilitated by the JORAM messaging service which relays the commands made by Dave to Alice’s screen, for example by displaying the button pushed by Dave in a specific color. It is very difficult, however, for Dave to know what Alice is doing (reading the course lesson, reading the practical session subject, or watching him doing a demonstration). The user-induced messages are summed up by the black arrows in the above scheme. 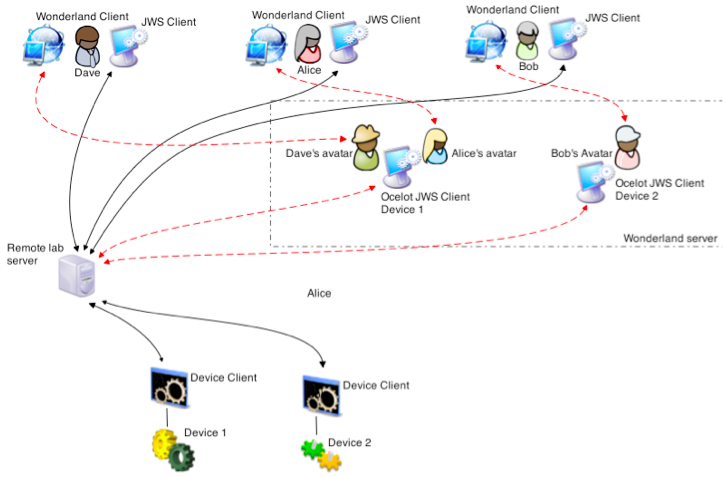 By integrating and using the device control software in a virtual world such as Open Wonderland, collaboration between Dave and Alice is manifested by avatar actions and interaction. Now, when carrying out the actions described above, Dave can clearly see the level of Alice’s engagement in the process (is she watching the remote device on the screen or reading the practical session subject exposed as a PDF on a virtual wall, for example). The inspiration for this idea came from reading the WonderBlog article, Reviewing Wonderland Code In-World. Another advantage of collaborative working in the virtual world in this context is that Dave and Alice are now working on the same instance of the OCELOT remote client. This reduces the number of client launches, simplifies communication requirements between multiple instances of the client, and removes competitive/conflicting commands sent to the remote hardware. Remote laboratory realism, i.e. physical representation of the real laboratory (“reality awareness”). In terms of realism, our goal is for the remote user interface of the laboratory equipment be as close as possible to the physical interface. 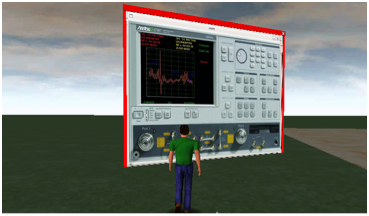 A user who has invested time to learn to operate equipment in the virtual world should be able to reap the benefits of this training when the time comes to use the same physical device (or vice-versa). The use of a virtual world helps us reach this goal since it allows 3D representation of objects and, therefore, realistic renderings of the physical devices. It is particularly interesting for a remote robotics lab in robotics. Apart from needing a dedicated server to run/host Wonderland, there is no substantial additional cost incurred for integrating laboratory hardware into Wonderland. Given that all the laboratory control tools are based on Java, and Wonderland worlds already have the ability to share Java applications through the X11 application-sharing mechanism, the different pieces of the puzzle are in place and technically feasible. The only item left to do is to declare the remote lab client software as a shared X11 app. 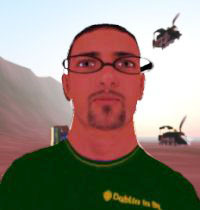 Below is a screenshot of an avatar using such a client in Wonderland. The main additional overhead is network bandwidth. The bandwidth requirements for the use of avatars and audio communication adds some complexity in terms of interactions/data transfers and increases network traffic. Use of a Network Analyzer in the “Remote Lab”” using OCELOT framework in Wonderland. We don’t typically republish blog articles on Wonderblog, but I know many people are interested in empirical research that documents positive learning outcomes from use of virtual worlds, so I thought there would be significant interest in this article. For background, you might first want to read Nigel Wynne’s Wonderblog article on the COMSLIVE project or watch this news story that appeared on SkyNews at the end of December. The author, Colleen McCants from the University of Nottingham, is a multimedia graphic artist involved in e-learning since 1993. As ‘Cowlean Minotaur’ in Second Life, she builds fantastical teaching sims for the University of Nottingham’s virtual campus, described on her builder’s blog. Nigel Wynne, co-host of the Forum and Senior Academic in Learning and Teaching in the Faculty of Health at BCU, gave a synopsis of his research funded by JISC LTIG, ‘Communication Skills Learning within Immersive Virtual Environments’, which was concerned with deficits in nursing students’ communication, team working and delegation skills. According to the COMSLIVE website, poor communication is indicated in numerous unanticipated patient deaths and illnesses within the UK and US health care sectors. Basing the research around the null hypothesis that students would not benefit from learning scenarios in a virtual world, Nigel Wynne and Emma Winterman conducted exercises in the java-based, free and open source, Open Wonderland sim, in which student volunteers could explore teamwork productivity exercises designed to support adoption of collaborative skills. Based within a randomized control trial research design, intervention group teams engaged in Wonderland patient scenarios. 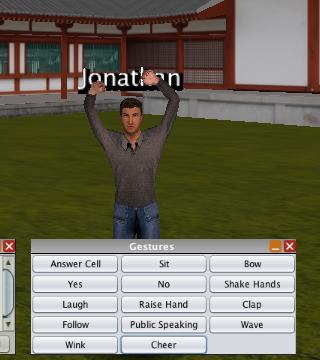 Interaction with virtual world patients was followed by physical world higher fidelity computerized mannequin based simulation activities. During these activities the performance of students who had experienced virtual world learning were compared with control group students who had not. Real world behavior of these teams was observed and rated. Given the assumption from the outset that the benefit of the scenarios would not be realized, they were surprised when intervention group students significantly outperformed control group students. Intervention group students found their virtual world learning experience both positive and indicated it was having a lasting impact on their behavior during clinical placements. Intervention group students showed improvements in such skills as practicing ‘paraphrasing’ and in showing assertiveness to change others’ behavior for a positive outcome. Using the telephony integration afforded by Open Wonderland, part of the virtual world scenarios involved using a ‘softphone’ within the sim to make a call to a tutor in the real world. During this telephone simulation students were able to practice having their requests understood and prioritized, using the Situation-Background-Assessment-Recommendation protocol. Open Wonderland was found to be ideal for the learning and teaching scenarios from the development side, in that it could be run from behind a firewall, allowed LDAP authentication and enabled an ‘open art pathway’. Models from SketchUp, Maya and 3DS Max could be imported with relative ease, and the drag-and-drop insertion in-world of models from Google Warehouse was most useful. 3D assets created for a parallel teaching project, Virtual Case Creator, were imported, saving significant development time. Firefox worked as a browser in-world, enabling creation of monitor screens delivering real-time information via web browser windows. In practice they found the sim loaded quickly, slowed only by client specifications. From 2011, use of the COMSLIVE sim will be mandatory for year one health care students. The Open Wonderland platform is scalable, allowing continued expansion of the virtual scenarios. Potential exists to support the Interprofessional Learning agenda and Objective Structured Clinical Examination testing. Nigel introduced the talented team behind the development of COMSLIVE and VCC, Janine Dantzie and Tim Marquis. Tim chose to demonstrate his enthusiasm for the UNITY game development tool. Delivering games via web browser and allowing for an amazing level of detail, the creative pipeline he described was smooth and facile, and the support community the most helpful in his experience. In 2010, Unity won the Wall Street Journal’s Technology Innovation award in the software category. Obviously, this is one to keep in sight. Features for the tool are reviewed here. I hope some of you will be interested in signing up for this new Open Wonderland course organized by one of our most active community members. Hello all! My name is José Domínguez (aka Josmas Flores) and I am a researcher at Trinity College Dublin, in Ireland. I have been a member of the Open Wonderland community for the last number of months, and you can generally find me on the forums or the development meetings on Wednesdays. It’s been such a great experience so far that I thought it would be a great time to give back to the community by organizing a development course. The course will be delivered through the Peer to Peer University (P2PU), an online community of open study groups. The Peer to Peer University is a bit different. All work is done through P2P collaboration, and courses generally run for 6 weeks. You do not need to be an expert to organise a course, mainly because you will be a facilitator, as opposed to a teacher/lecturer. All you need is a collection of open accessible resources to run a course (you can also create your own), and make participants understand that they are ultimately responsible for their own learning. I think this model fits the software profession perfectly, if you compare it with the individualised approaches of any ‘normal’ university. It reflects quite well how programmers learn after finishing ‘formal’ education, when we have to join the workforce. You will not get a degree after finishing a course at P2PU, but you might get much more out of it. Target audience: I am targeting participants with at least 2 years Java programming experience, be it in commercial environments or College/University. Although you do not need any knowledge about Wonderland itself, you do have to be willing to work on your own, as well as in groups, with the documentation and resources available. Participants are expected to know how to use tools such as subversion and ant, and be comfortable with working from the command line. The course will not cover these basics. Please review the sign-up task before applying for the course. In a pure peer-to-peer spirit, the syllabus is open to participants. My main idea is to create different groups, depending on the interests of the people attending, but all these can be organically changed. Initially, all participants will join a “General Development ” group, that will tackle Wonderland module development with the goal of getting people up to speed in how to create modules. Work can continue through a “Scripting” group, with the intention of exploiting the vast possibilities of the scripting engine. We will also be exploring when scripting is more appropriate than Java module development. Other groups that might emerge during the course are “SCM” (a software configuration management group to explore building and automation of the system, including source control and dependency management) , or “Automated Testing ”, a group to test the system from within. During the course, I also intend to organize ‘Software Craftsmanship workshops’, in areas such as pair programming, software katas, randori, TDD, BDD. The idea is to introduce the techniques, and then try to find ways in which they could fit within a Wonderland development context. This is a ‘distance learning collaborative experience’, and I do not expect people to be meeting face to face, but I do expect meetings avatar to avatar. It is definitely not the same, but in my opinion, is the closest experience to the real thing that I’ve experienced so far. The initial idea is to meet at least once a week (for 1 hour) on one of the Open Wonderland community servers. Times will have to be decided after the sign-up process, and will reflect the geographic locations and timezones of the participants. I am willing to organise as many meetings as needed to accommodate all participants. In summary, if you are interested in learning through technology, be it software development, testing automation, SCM, and so on, and you want to do it within an existing system, and more importantly, in a collaboratively, community-based way, please have a look at the course. Dates: Starts on January 26th (2011), and runs (initially) for 6 weeks. For schedule and syllabus, please follow the course link. After a week on vacation, I was excited to find an unexpected holiday gift in my inbox: code contributions. From fixes for typos in the web UI, to animation updates, voice bridge updates, and even a whole new gesture HUD (! ), my inbox was brimming with patches. I’ve tried to acknowledge contributions in the various change logs (which you can find here, here and here), but I wanted to say a more public “thank you!” to all the contributors. I would also like to add a word of encouragement to people who have already made changes to Open Wonderland code: please send us your patches! Whether they are simple or complicated, related to the core or to modules, we would all love to see the results of your hard work. If you have a change you would like to contribute, I recommend you file a request for enhancement in the issue tracker, and attach your patch there to make it available to everyone. This will also allow the module owners to review the patch for inclusion in the Wonderland trunk (we just ask you to sign our contributor agreement). Happy New Year Everyone! I hope you all had an enjoyable holiday season and are ready to work with us to make Open Wonderland the premiere virtual world platform in 2011. To start off the new year, I thought I’d share this message I just received from WordPress about our blog. It’s good baseline data to have just at the time we’ve begun working on search engine optimization for the Open Wonderland site. Next year at this time I’m hoping we’ll see a much broader list of “referring sites” as well as a general uptick in the number of views and comments. The Blog-Health-o-Meter™ reads Wow. We think you did great! In 2010, there were 56 new posts, growing the total archive of this blog to 170 posts. There were 513 pictures uploaded, taking up a total of 102mb. That’s about a picture per day. The busiest day of the year was February 4th with 477 views. The most popular post that day was The New Wonderblog. The top referring sites in 2010 were openwonderland.org, blogs.sun.com, projectwonderland.com, facebook.com, and twitter.com. Some visitors came searching, mostly for open wonderland, wonderblog, openwonderland, open wonderland download worlds, and project wonderland firewalls and proxies. You are currently browsing the Wonderblog blog archives for January, 2011.